Almost two and a half years ago, I created an account on a Chinese question-and-answer website and started to answer some questions regarding linguistics and languages raised by laymen Chinese netizens. It is my pleasure to introduce linguistics to the public in Chinese – after all, “modern western linguistics” itself is a relatively new concept to teenagers and young adults, and some people are curious about that. Although most of the questions I came across are rather basic and some not very scientific (for example, someone may question me if Chinese really has grammar, which is not a very good question from my point of view), I am more or less satisfied if people can know more about the scientific studies of different languages, and even decide to take a course in linguistics. However, I constantly receive some criticism from certain audiences, not about the content of my answer, but about the way in which I deliver it, or, to be more specific, about the languages I use when I talk about those topics. They told me politely or impolitely that they were “annoyed” by the use of English terminologies in my answers, and by putting English words in a Chinese article, I was “damaging the beauty, purity and integrity of Chinese”. Someone even “threatened” me that he would give up reading my answers because he cannot stand the English words in them. Before I started this blog, I did a calculation on my ten most recent answers to linguistic questions, and found that over 90% of the text was written in Chinese, though I did use a lot of English terminology when I talked about some linguistic theories. I am going to protest my innocence here – I really do not choose to do so. I received most, if not all, of the content related to linguistics in English, and currently I see English as my major working language. The influence of English is so deep-rooted that whenever I would like to refer to a ready-made concept in linguistics, such as “psychotypology” (see my previous post for more details), “telicity”, or “aspect marker”, the first words that pop up in my mind will be in English, and I barely know their translation equivalents in Chinese. Therefore, almost every time I intend to introduce a new concept to my audience or refer to the key research methodology, I will put it in English first and try my best to give an appropriate Chinese translation, while the rest of my answer is in Chinese. Maybe you have already realised that this phenomenon is called code-mixing or code-switching. In sociolinguistics and second language acquisition, it is a long-standing topic and has been investigated from various perspectives, including the roles of the matrix language (the language that forms the grammatical structure of a chunk of utterance) and the embedded language (the language that provides the “mixing” words in the chunk), the social identity of code-switchers and opinions from the surrounding, and other possible areas. I am particularly interested in the word types, the pedagogical methods and the linguistic code appearing in code-switching. According to my personal observation of myself and friends with similar sociolinguistic background, whether you switch the code to the filler language depends on two different factors. The first one is what type the word or phrase is, namely content words (nouns, verbs, adjectives, etc) or grammatical words (pronouns, prepositions, conjunctions, etc). The Differential Access Hypothesis, which is a well-discussed framework of code-switching, assumes that content words and morphemes appear more frequently in the embedded language while grammatical morphemes tend to appear in the matrix language (Myers-Scotton 2005), and a number of finely recorded or anecdotal data can support this hypothesis. More importantly, the use of code-switching is somehow related to the environment and method you acquire the word by – actually, it is related to how you add the new word in the second language to your “mental all-language dictionary” – the multilingual lexicon. We assume that we store the vocabulary we know in different languages in a unified structure, and a simple illustration of a possible bilingual lexicon, which is developed by Kroll and Stewart (1994), is listed here. The Revised Hierarchical Model by Kroll and Steward (1994). Figure from http://www.psu.edu/dept/cls/purplelab/research/research.shtml. This proposal of the bilingual lexicon provides a vast amount of information for us to raise different hypotheses about how bilinguals memorise and use words. We can also get some inspiration from it to explain the choice of code-switching. For sequential bilinguals like me, namely people who start to acquire the second language after mastering their first language fluently, we start learning words of a second language by matching the words to the translation equivalents. For instance, when I first learnt the word “apple” (which is among my first English words), I did not establish the link directly between the the English word “apple” and the round red juicy fruit, but made an interchange at the Chinese word “pingguo”, since I learnt the word via Chinese translation and I needed to rely on the Chinese word to retrieve the English word at an early stage of acquisition. 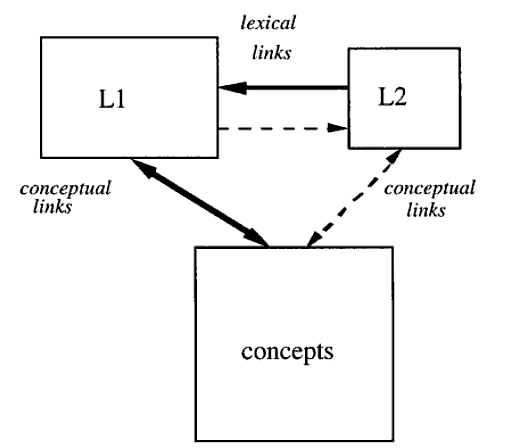 That is the reason that the link from one’s second language to one’s first language is much stronger than the link between the concept and one’s second language. In that situation, since we get a stronger connection from the concept to the first language than to the second language, we will continue to use the first language words in the utterance. That is applicable to some content words and most grammatical words, which can also explain why we always use our first language as the matrix language of code-switching. Things become different when we acquire a new word in the use of a second language. This includes some second language immersion programmes (you can see a lot in Cambridge every summer), using the second language as the working / teaching language (which is the case when I was in Hong Kong and the UK), and other environments in which you do not always use your first language. In that situation, we can directly build up the link between the form of a second language word and the concept it represents, and there is no need to refer to the first language vocabulary anymore. When we retrieve these words and examine the connections between concepts and word forms, we will find that the second language words are more readily used, and we are tempted to use them even if the rest of the utterance is organised in another language. Linguistic terminology in English is a good example for me: the imbalanced bilingual lexicon drives me to use English words when I think of the concepts, because that is the easiest way to do so. Code-switching is definitely more complicated than word switching, but I just want to present an alternative viewpoint to the whole picture. Maybe the language purists simply cannot understand the use of two different languages at the same time, and they can only attribute such things to showing off, but I believe that the motive is more cognitive. Previous investigation of code-switching indicates that code-switching always comes with additional cost: code-switchers need more time to prepare for articulation (or typing, of course), and they may need to activate the words in the other languages and adjust the structure of sentences as well (see Meuter and Allport 1999; Meuter 2005). Nevertheless, my friends and I do code-switching all the time, and we do it for communicative purposes: if the English word can better deliver the intended message, why not use it in an utterance? After all, as intelligent animals, humans will not do anything without considering its convenience, and language use is no exception.